My junior high school days. My relatives said I looked good in that pose. A photograph to commemorate the first successful cloning of the adrenocorticotropic hormone. The late Shosaku Numa is on the left in the front row, and I am on the right. Celebrating my 60th birthday in the lab. I have a sweet tooth, so they gave me 60 wonderful cream puffs. The Osaka Bioscience Institute has five research divisions. I am in charge of one of them. I was born and reared in Ogaki, Gifu Prefecture, which was an old castle town, and grew up in a large samurai home. My mother was responsible for handling the household affairs during the turbulent years immediately after the war. She insisted that her children get an education, and wanted them to excel in a specific field and make a name for themselves. I was aware of my mother’s expectations from an early age, and began looking for a subject that I could enjoy and master. When I was young, my uncle, a chemist, took me to his lab at the university. When I saw my uncle engage in lively debates with his students, it became my dream to become a researcher. I began to think about things and study in my own way, and I came to believe that doctors offered the most direct benefits for other people. I decided then to go to medical school. When I was admitted to Kyoto University, it was my intention to become a clinical doctor. I realized, however, that there was still no logical explanation for many diseases, and so decided that medical research and its systemization suited me best. This path is the foundation of medicine. It was likely that my aspiration was always to be a researcher. One of my friends in school at that time was Tasuku Honjo, and that friendship has continued for 40 years. 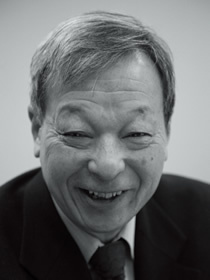 When I saw the activities of my colleagues in the clinical field, such as Koichi Tanaka, who successfully performed liver transplants, and Masakiyo Nobuyoshi, who developed treatments for myocardial infarctions using catheters, I began to wonder if I should choose that path and devote myself to treating patients. I don’t know whether I would have succeeded or not. In the field of basic medicine, I chose to study medical chemistry, believing that observing the phenomenon of life through substances suited me. It was the study of enzyme. In those days, it was becoming understood that enzyme controls a complex metabolic route in cells, and that enzyme itself is also subject to control. However, I also saw there were limits to research into the protein chemistry of enzyme. The basis for controlling proteins is the adjustment of the genes that make the proteins. Therefore, progress had to be made in providing a greater understanding of the genes to unravel the principle of the synthesis of enzyme and hormones. I thought I had found my path at last. Nonetheless, it was extremely difficult dealing with genes in those days. Research01:Toward bioplanetary science. Considering life from the origin of planets.